With good reason, this decade became known as the ˜Swinging Sixties’. For hip teens and twenties, it was ˜with it’ to hang out at the discotheques, where the latest dance craze was the Twist, brought over from the USA in 1961 by Chubby Checker. Boutiques flourished with the latest fashions Gear Guide provided a Who’s Who of Carnaby Street and King’s Road, Chelsea. The look was of Twiggy or Jean Shrimpton, the trendy hair of Vidal Sassoon, and wolf whistles for the revealing mini skirt. But the spark that set this youth revolution alight was the new beat of pop music. 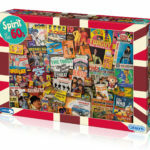 The Beatles and the Rolling Stones, and many more with vibrant LP sleeves, created an art all of their own. It was a television series that propelled the Monkees to stardom and onto the packets of sweet cigarettes. Television created much of the energy of the decade and the memories. The mid Sixties brought with it Ready Steady Go, with Cathy McGowan, while Top of the Pops spread the latest upbeat sounds. Radio Luxembourg and the pirate radio stations of Radio Caroline and Radio London increased the volume, especially on the widely used transistor radios. After the pirate stations were banned, Radio 1 became the pop music channel from 1967. 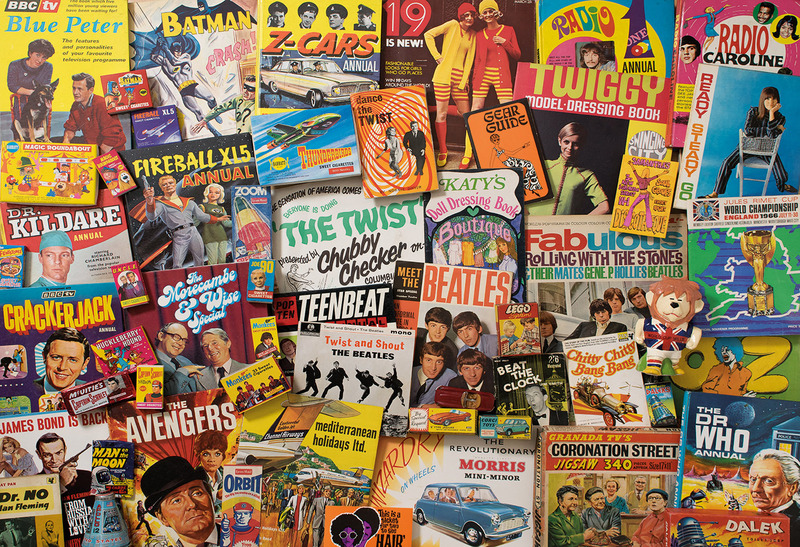 With the addition of BBC 2 in 1964 (and colour by the end of the ’60s), television was full of excitement Z Cars, Dr Kildare, Crackerjack, the Avengers and the Morecambe & Wise show, and all had their annuals. Increasingly, economic flights to continental destinations encouraged the package holiday maker who came back with a taste for different cuisines even if it only came from a Vesta pack. 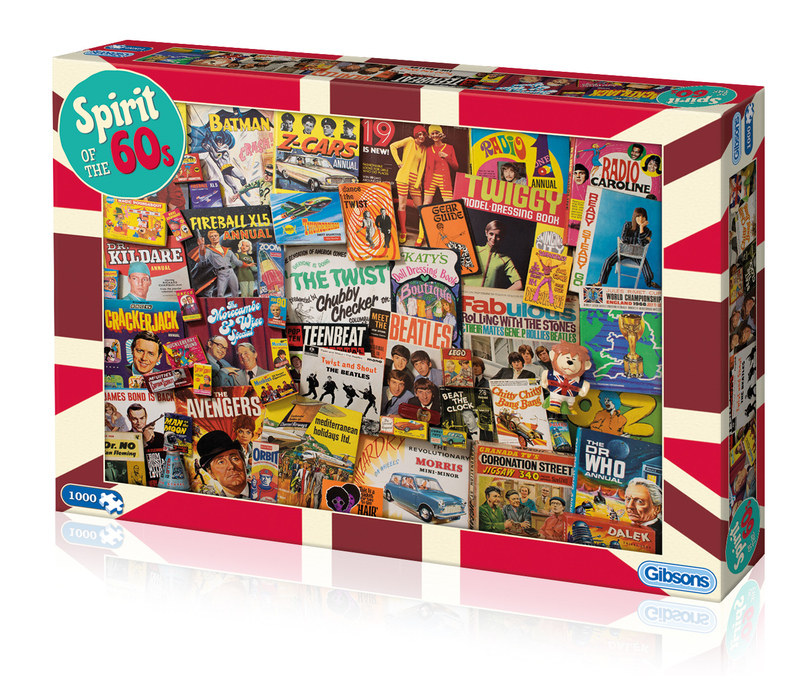 The 1960s also saw the arrival of Ski ˜real fruit’ yogurt, Lego bricks, Barbie and Sindy dolls, the Mini, the E-Type Jaguar, Coronation Street, James Bond films and Dr Who fighting the Daleks. The sporting achievement was England winning the World Cup in 1966; the technological achievement was man landing on the moon in 1969. As with all Gibsons jigsaws, the beautifully illustrated pieces are made from the highest quality 100% recycled board and are therefore a pleasure to work with again and again. Details: High quality 1000 piece jigsaw puzzle. Jigsaw puzzle measures 49x68cm when complete. Made from thick, durable board that is 100% recycled. Also available as a 500 piece puzzle.